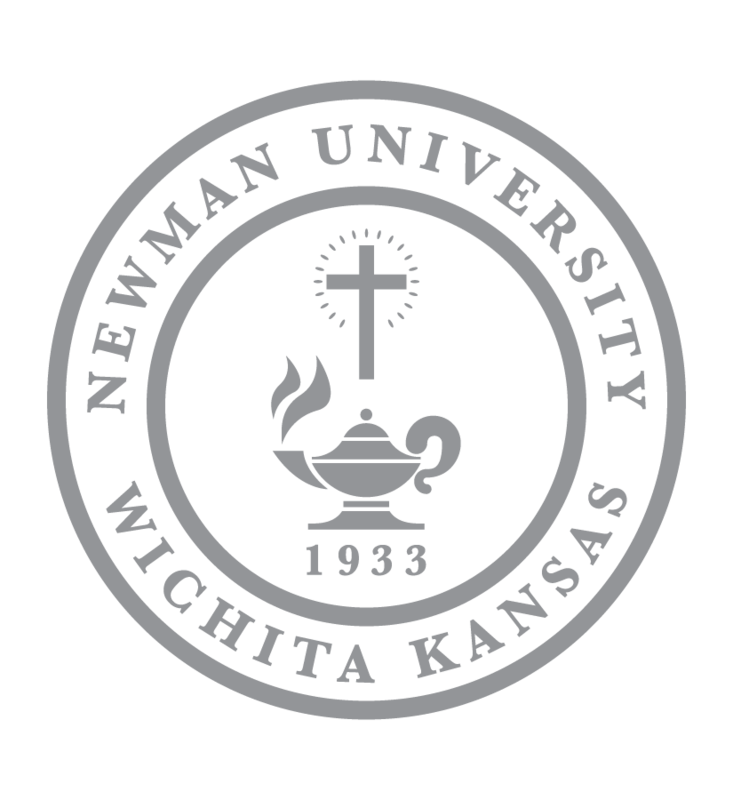 A total of 13 seminarians from Wichita and surrounding states are taking an intensive Spanish program at Newman University this summer. 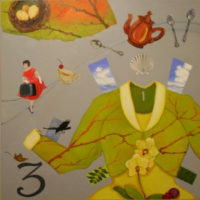 The program is an intensive Spanish immersion comprising two levels of Spanish — one in June, and another in July — from 8 to 11:50 a.m. Monday through Thursday. Seminarians will also complete a conversational “Spanish in Community” course, which includes dining with Spanish conversation assistants from the community. 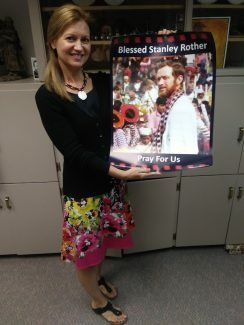 Sonja Bontrager holds a poster of Blessed Father Stanley Rother — a Catholic martyr whose story is incorporated into the curriculum of the intensive Spanish program. 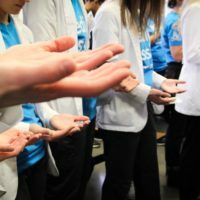 The program is based primarily at the Adorers of the Blood of Christ (ASC) Wichita Center but also uses classrooms in Eck Hall as needed for special activities. Bontrager will not be working alone. Wichita community members Lois O’Malley, CSJ, Michelle Hagerott, W. Michael Barton and Kristen Hock will each bring unique expertise and perspective to the program, Bontrager said. The “Spanish and Community” class also gives seminarians time to visit with Spanish-speaking representatives from the community. A few of these individuals include Newman staff members Jeanette Ayala and José Montes, who act as “acompañantes,” or conversation assistants, to the seminarians. 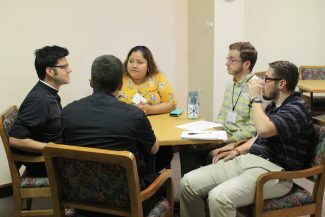 Seminarians practice their Spanish-speaking skills with conversation assistant Jeanette Ayala during the “Spanish and Community” portion of the program. As the program continues, Bontrager plans to take students outside the classroom, which she says will give plenty of opportunities for Spanish-speaking conversation. 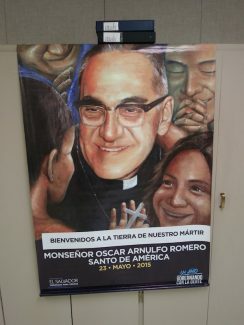 A poster of Monseñor Oscar Romero. 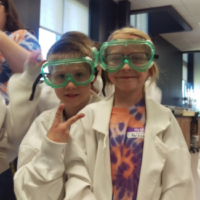 In addition to class time, there are ample opportunities for Spanish immersion. 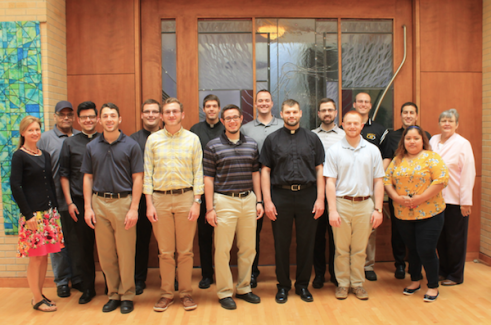 Each seminarian is matched with a host family whom he will meet with throughout the program. Bontrager said this not only allows for a fuller immersion experience but also the opportunity to get to know the family and their experiences while speaking Spanish when they are together. Other activities include cultural presentations and speakers, a field trip for “paletas” (a Mexican frozen treat), tours of a sweet bread shop and tortillaria, the option of attending a wedding at the Cathedral or even a quinceañera at St. Anne’s Catholic Church. In past years, the Diocese of Wichita has held a summer intensive Spanish program in Pittsburg, Kansas. 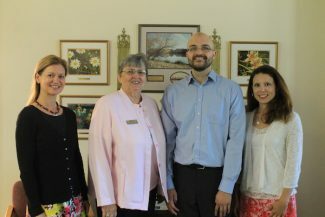 (From L to R) Sonja Bontrager works alongside Sister Lois O’Malley, CSJ, W. Michael Barton and Michelle Hagerott. Associate Professor of Theology and Dean of Graduate Studies Father Joseph Gile said several Mexican sisters, who are known as the Guadalupanas, worked in the parish in Pittsburg and helped with the language instruction. Students were often placed in the homes of native Spanish speakers around Pittsburg and then joined together each day for class at the parish. Gile said that, while this program is not entirely new, it is new to Newman. Gile said he hopes this experience of immersing seminarians in the program will allow the eventual priests to minister to the large and growing Hispanic population in the Diocese of Wichita.